A plethora of Pens fans finally got their wish, as perennial whipping boy Ryan Whitney was just shipped to Anaheim in return for wingers Chris Kunitz and Eric Tangradi. 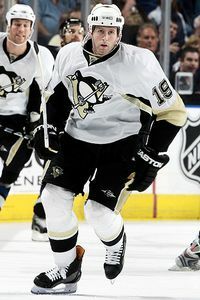 The move also prompted the Pens to drop forward Chris Minard in order to make room on the roster. Early reaction has been mixed but leaning towards the negative side, mostly in the camp of the Penguins not getting enough in return for a defenseman that has been highly regarded in the recent past. However, this might not be the last deal Ray Shero makes before the deadline, so don't be too quick to set this new roster in stone. Another interesting angle is the Ryan Whitney scratch last night to be with his family in Boston. As it works out, Anaheim plays in Boston tonight. Conspiracy theorists, knock yourselves out on that one. So what about the incoming players? Well, the 6'0", 195-pound Kunitz has 16 goals and 19 assists for the Ducks this season. His career averages are about 21 goals and 29 assists per season. He'll turn 30 in September. He was a Hobey Baker Award finalist in college in 2003 at Ferris State University, he won the Stanley Cup with Anaheim in 2007, and he played for Team Canada in the 2008 World Championships. He's being marketed by Dan Byslma as a gritty player. The 6'4", 220-pound Tangradi, 20, was ranked as the #2 prospect in the Ducks organization. This season, he's accumulated 38 goals and 49 assists in 52 games with the Belleville Bulls of the OHL. The Philadelphia-born winger also played for Team USA in the 2009 World Junior Championships in Ottawa. I would think Tangradi could be the real x-factor in this trade, as his seems to possess some genuine upside. Unfortunately, his time will not come for a while, so that really doesn't help the cause much right now. And that's all most people care about. I'd disagree with the initial reaction as being negative. Whitney has been an absolute dog the past two years, and has been trending even worse lately. Who knows what will happen with his foot issues long-term, and on a team that already has several other offensive defensivemen (who are all better in their own zone than Whitney), he had to go. Kunitz gives them a gritty, Ryan Malone-type player under contract for 3 more years, and Tangradi is a very intriguing prospect. Maybe this isn't as splashy a trade as the Hossa deal, but it's a fair trade for both sides and the Pens don't have to worry about ending up empty handed like they did when Hossa bolted to the Wings. Something had to be done. I watched the game last night from the Islanders feed and the announcers were remarking how amazing it was that Crosby and Malkin are doing as well as they are with the quality of wingers they have playing beside them. Mostly negative from the local media (ponderous) but the majority of the fans (myself included) are thrilled just to see Whitney go, regardless of who they got in return. I don't know how anyone could think Britney was worth more and with every game he played, he was hurting the team while killing his own value and the teams chances of getting anyone in trade for him. Shero had to jump on that deal. I actually hope he does well with the Ducks, just for his own sake but I think he's going to be a huge disappointment for them. The Western Conference will eat a player like him alive. If they were looking to find a fill-in for possibly losing Pronger, they'd have a better shot by signing a one-armed, red headed girl scout. The trade really comes down to Whit's foot. The injury may hold back Whit for the rest of his career, and if it does this would be a great trade for the Pens. I've heard Kunitz is a Dupis with hands, that bodes well for his success with Crosby.